A few days ago, I showed you these fabric baskets that I had made using the legs of an old pair of jeans. They are just so quick and easy to make. 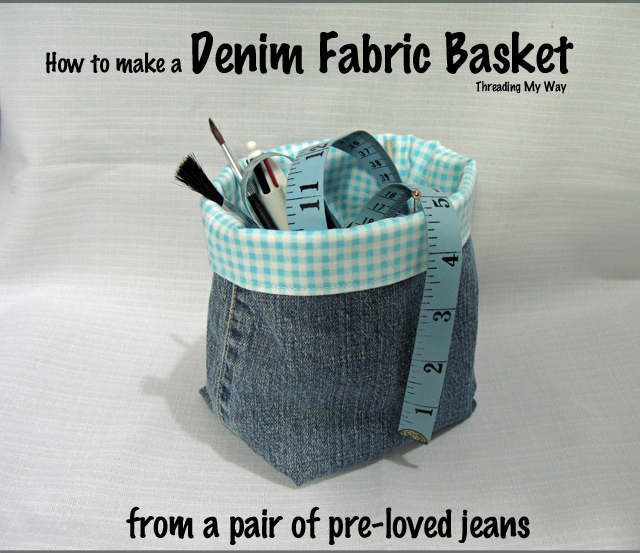 Here's the how to, so you can make your own denim fabric baskets using pre-loved jeans. Choose a section of the leg of the jeans where the top and bottom of your cut piece are the same width. If your jeans are shaped and you cannot get a piece that is the same width top and bottom, you will need to unpick one seam and cut the fabric. The instructions are for jeans that can be used without the need to unpick the seams. I used a medium to heavy weight, woven sew-in interfacing, but you could substitute this with a different weight interfacing, with iron-on interfacing or with batting. It all depends on the look you are after. You will need to alter the measurements to utilise the jeans that you are using. Add 1/2" to the width of the lining, for the seam allowance. All seams are 1/4", unless otherwise indicated. Some of the seams will be quite bulky. Open seams where possible to reduce bulk and go slowly over bulky seams. 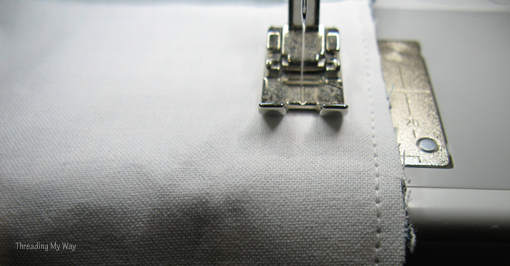 If necessary, turn the machine by hand (using the handwheel), over bulky seams. Read my Tips for Successfully Sewing with Denim. 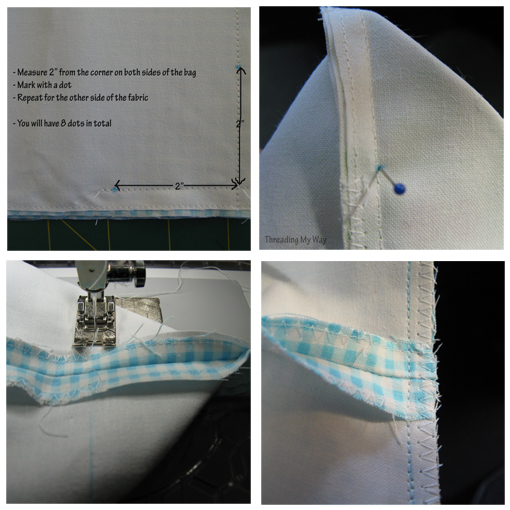 Sew the interfacing to the wrong side of each piece of lining fabric. Sew close to the edge of the fabric. If you are using iron in interfacing, follow the manufacturer's instructions. Sew the two side seams. 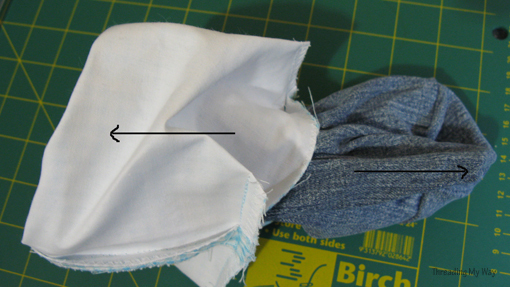 Sew the bottom seam, leaving a gap of 3 inches. Press all seams open. You won't be able to open the seams at the corners. This won't matter as the corners will be cut off in the next step. Probably not necessary, but I neaten the edges of each seam. NB: The measurements from here on are for the small basket. Measure 2 inches from the corner seam (don't measure from the edge of the fabric) in both directions and on both sides of the fabric. Put a mark to show where 2 inches is. You will have 4 marks on the front and 4 on the back. Pull out the sides of your bag. Put your pin through the top mark. If the pin comes out through the mark on the other side, your boxed corner will line up. Make sure the seams are open to reduce bulk. Take the pin out and hold the fabric in place. If you would like, hand sew in place to hold. With a ruler, draw a line across the fabric. Turn the jeans wrong side out. 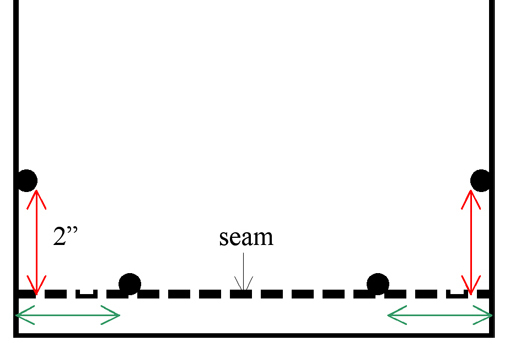 Neaten each side of the seam separately. Measure 2 inches from each side edge of the fabric. The front and back of the jeans may be different widths, so the seam may not be on the edge. 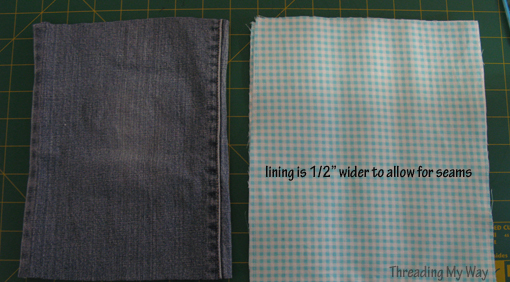 Measure 2 inches from the bottom seam, on both sides of the fabric. Put a mark to show where the 2 inch marks are. You will have 4 marks on the front and 4 marks on the back. 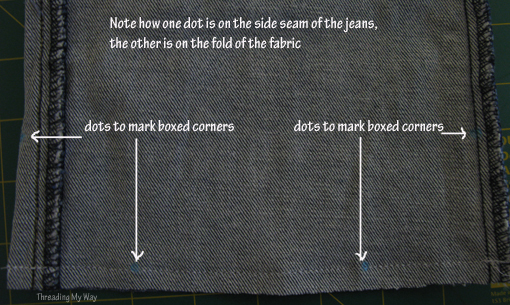 Line up the marks you have made, not necessarily the seams, as the seams of the jeans may be off centre. Place the bag inside the lining. ie: the right side of the bag is next to the right side of the lining. Line up the top edges of the lining and the outside. To reduce bulk, off set the lining and the jeans seams slightly, so they are not directly on top of each other. Off setting the seams will help with this step and with the final topstitching. Baste (hand sew) the top edges of the lining and the outside. 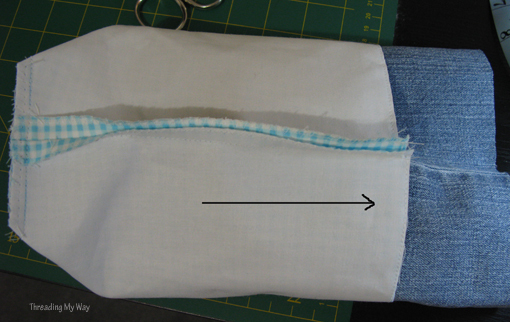 Sew a 3/8inch seam to join the top edges of the lining and the outside of the bag. Gently pull the right side of the bag out through the lining. Hand stitch or machine topstitch the gap in the lining. I hand stitched the small basket, because the gap was too close to the seams to machine stitch. Iron the top edge of the bag. Topstitch 1/8inch (3mm) from the edge, around the top of the bag. This step is where you will find the most bulk. Go slowly over the bulky seams. If necessary, turn the machine by hand (using the handwheel), over the bulky seams. 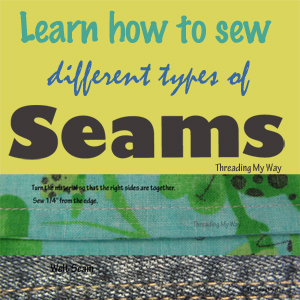 If your machine can't handle sewing over the seams, you can omit the topstitching, or topstitch the front, stop before the seam, then topstitch the back, stopping before the 2nd seam. Fold over the top about 1.5". You can vary the shape of your fabric baskets by changing the measurements for the box corner. The width of the basket will be twice the measurement you make for the box corner. 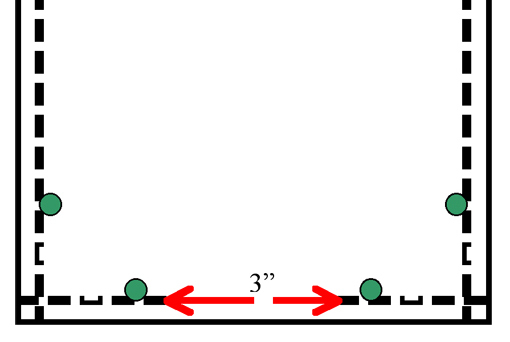 eg: If the box corner is 1.5", the width of the basket will be 3", as for the basket above. The height of this basket is also larger. The middle sized basket has a box corner of 1.75", making the width of the basket 3.5" wide. I think the smallest basket is my favourite. It's like a little box. Experiment with the jeans that you have on hand. 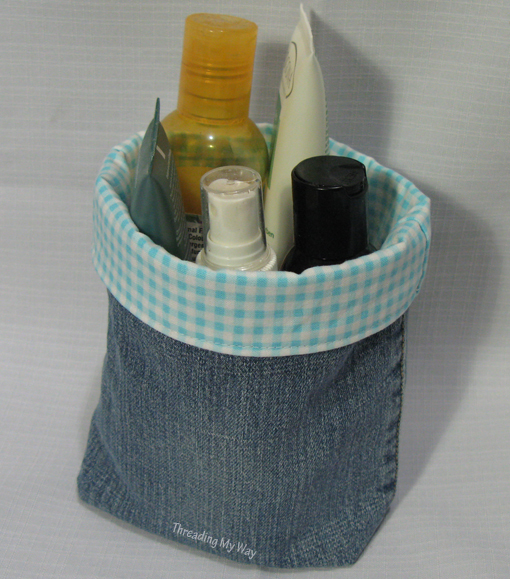 You can make your baskets tall or short, wide or thin, depending on what you will be putting in your denim fabric baskets. Leave me a link in the comments, to any fabric baskets you make using this tutorial. I'd love to have a look. These are adorable! And they'd make such cute gift baskets. I'm thinking about making denim Christmas stockings this year. Christmas stockings from denim would look great!!! Here's my idea for Christmas stockings in just a few words... cut the sleeves off of old (X-mas/Winter design) sweaters. The 'curve' from the top of the sleeve makes an ideal 'toe' of the sock, and the cuff of the sleeve is already finished for the 'top' of the stocking! So cute! And such a great way to upcycle old denim!! Pam, Thank you so much for posting the tutorial. 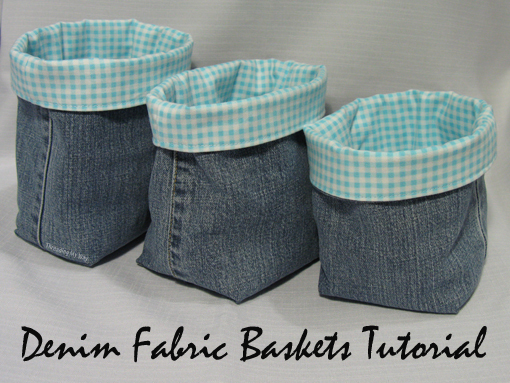 I was sharing with a friend about these denim baskets and hope to make some at end of this summer....I think they are such a great idea! Thanks for the tutorial, Pam!! Fantastic, Pam! It's very useful. Thanks. Hugs. I had read your previous blog about these bags and immediately went to the Salvation Army to shop for fabric. I found some beautiful 100% cotton skirts and co ordingating color jeans. Yellow, pink, aqua and green jeans. Now that I have the tuturial I can get to work stitcing them up. Love the recycling aspect of this project. great idea, great project and very practical. I'd love to see photos of your finished baskets!!! Oh so lovely - I've been using my hubbys jeans for pot holders - looks like I am about to switch to baskets!!! I love these. What a cute idea! olá, adorei suas cestinhas, servem para várias utilidades.Parabéns!!!! !ideiasmil.blogspot.com me visite, irei adorar sua visita!!!!!! This tutorial is a great idea, thanks for share with us. I may try this. I'll let you know if I do. Have you done it without the interfacing? I don't think I have any. Great tutorial Pam! I love these baskets! Thanks for the tute. As a obsessive denim upcycler, any fun new ideas are gold! Thanks again. This is great! I wish I had known about this when my kids were small. They always had so many tiny treasures that needed separating and storing. Legos! How great these would have been to store all those. I'm going to make a set for the neighbors' new baby so they will be ready from the start. Thanks for sharing. Thanks for the idea! I'll be adding this to my project list for my Bag of the Week blog. You can see what I've done with our old jeans at http://ogno.blogspot.com/2012/01/weeks-1-2-this-project-started-out-two.html I have one daughter who's a collector, everything from sea shells to stuffed animals. These would be a prettier alternative to the cardboard boxes she's using now. Thanks for the great idea! I just repurposed a pair of old jeans into an apron and I'm left wondering what to do with the legs - now I know! So cute! I love everthing recycled. Finally, something to do with all the legs I have in my stash! I am featuring you this week at my I Love Fridays party! Feel free to drop by and pick up a featured button :) Can't wait to see what you link up next! Great idea. 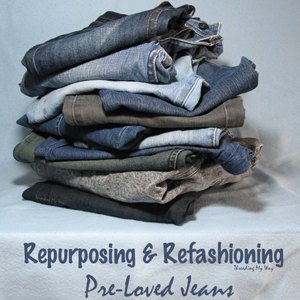 I think every crafter has more old jeans to use than any other fabric. So new ways to use them are always welcome. I love denim and am currently working on a way to make denim beads for jewelry making. Stop by my blog in a few months hopefully I will have a completed post by then. This a very great tutorial! What a fab tutorial! I'm gutted that I cut all of my old jeans up, ready to sew with! it is a great idea. I think I would find a way to use a pocket or 2. I was thinking sewing stuff and the pocket would be a good place to put scissors or something you wanted to keep close at hand. This is such a great idea! Thank you so much for the wonderful tutorial. Great Idea found your project on face book. Thanks for the great tutorial. Beautiful baskets. Love the idea. I'm going to use it one time! 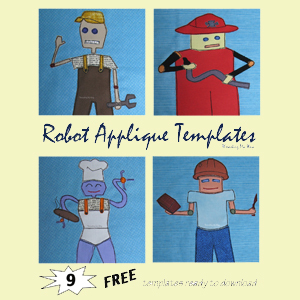 This is a fantastic idea you have so many good ideas....The tutorial is great! That is super cute! I would love to make those. So fun! Newest GFC follower from Lines Across. I am hosting Mom's Monday Mingle now. Love for you to link up! Have over 170 moms blogs. Great place to network. Hope to see you there! These are fantastic! Thanks for the tutorial. I have one pair of jeans ready to cut up - but sadly they are already earmarked for another job. Just. Got. To. Find. Time. I'll be back to make some of these though when Baby Starfish is a wee bit older. Hi Pam. Oh wow - thankyou for sharing this pattern. I have a whole stack of old jeans that I have been keeping in the hope of finding a pattern like this. My only problem now will be resisting the urge to stop all of my other current projects to churn out a few of these. Kind regards, Kirrily. So cute! What a great upcycle! Thanks for the detailed tutorial, you give me hope that I could make one as cute as yours! Great tutorial I found this through Thriving on Thursdays. I have linked in a salad with leftover lamb. Have a great week. Very Cute! These would be great for birthday party favors too. Thanks for linking up at Mom's Library! Oh, I just love this one! Thanks for this wonderful tute & so many ideas ! Both of my grandsons were so blessed with new Christmas toys that their parents are wondering where to put them all. These baskets will be perfect, especially with lining from lefover fabric we have used in their rooms! 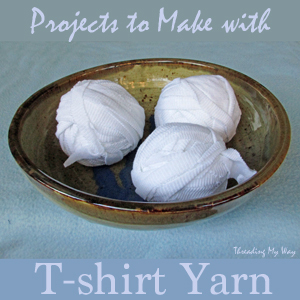 I look forward to making these! Thank you so much for the great tutorial! I love this idea! They are super cute and useful! I love these! I write a blog called Reese the Recycler and would love to feature these. I would give you credit and link back to your blog for the directions. Let me know if this would be ok,I'm including my email. I love this! Thanks for sharing. I have a lot of denim leftover from a couple of jean quilts that I Made for Christmas presents! Oh vielen Dank. Ich habe jede Menge Jeans und dafür kann ich sie jetzt super verwenden. I had completely forgot about this tutorial until I saw it on your pinterest board! I just got a ton of burlap coffee bags and think they would be great for something like this to put potted plants in!!! Hi. I just found you at Debbiedoo's Pinterest link party. What a cute project! 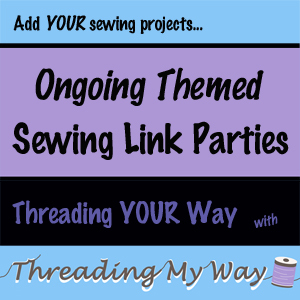 I'm looking forward to following Threading My Way and seeing more of your creativity. These are great! I'm making some for my sewing table. It is such a mess right now! I love this project. Thank you for the information. I think I will make some for my sewing room & my sewing friends. What a great idea! Love this great tutorial! 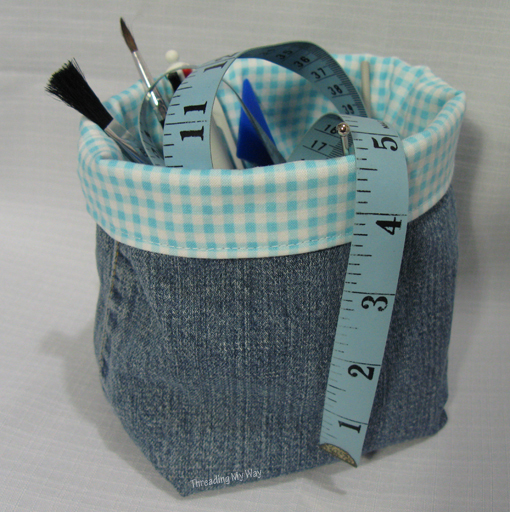 You bet I will be making these for knick knacks sewing holder! 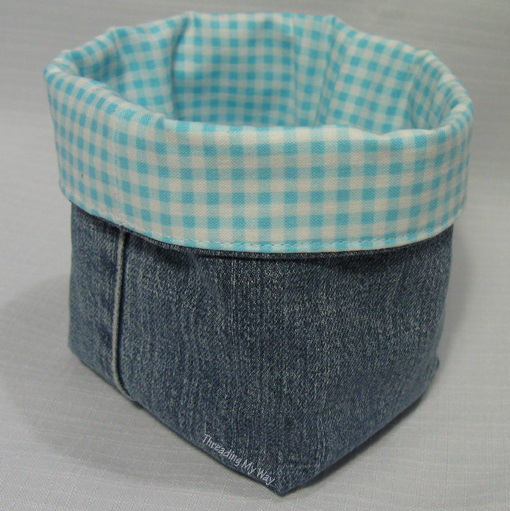 I just linked to this page from this page of my pattern index: http://craftscrazy.com/pattern-index/craft/sewing/recycled-basket-made-from-old-jeans/. I had originally linked to another blog, but it no longer exists. Let me know if you'd like to add more of your tutorials to the pattern index. Love to do with old blinged, rhinestone embellished jeans. I can't wait to try this! I have a denim basket pattern already, but I really like the boxed corners on this one--should make the baskets stand up by themselves better! Also, I've been looking for a quick gift project for our sewing guild! Oh I love this! My husband just tossed a pair of old jeans out - I'm going to grab them and make some baskets. I found you through Strut your Stuff..I would love for you to come share at our From the Farm Blog Hop! This was a great tutorial. I made some of these and I loved how easy it was to put them together. Thank you for making this an easy project. 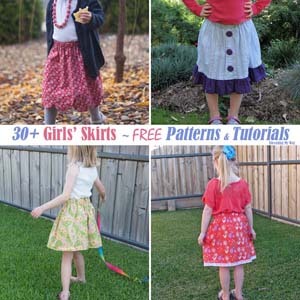 I am happy to see this tutorial I have some legs of jeans that I cut off for my son from the summer and I was wondering what to do with them seeing as I don't like to throw away good fabric even if it comes from doing alterations or old clothes. Thanks for sharing. 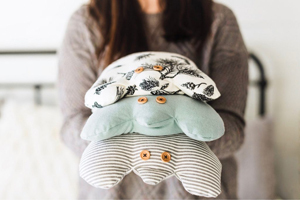 These are just adorable, and I cannot wait to try making a few! oh no!!!! a pair of old pants just went out in the trash!!! guess I'll have to wait to try this later,, but probably not much later with 5 men in the house there will surely be another pair of jeans for me to use soon! thanks for the Detailed directions! found you by accident, soooo glad. Just finished my 1st on with some old Jeans and some scrap material from when my Daughter was very young so it's a nice memory as well and its reversible double bonus :D Thanks so much for the tutorial Made a mistake though lol so basket is half size it should of been. Thanks for the link, but unfortunately it doesn't work for me. It goes to a slideshow which is all black. Can you try the link for one photo maybe? These are so cute, and think of the embroidery or anything you could put on the front! The possibilities are endless! Thanks, Maggie. 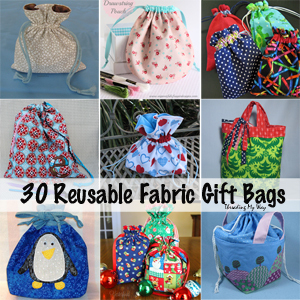 I ended up keeping them all for myself and use them in my sewing room. So cute. I made one myself by trial and error. Could have used the DOTS help :-) Great tutorial and instructions, so thank you for being so thorough. Love these bags. They clean so easily. Just throw them in the washer several times a year and iron the cuff. Those dots make lining up the seams so much easier, Jeannie. Is there a way to print the tutorial without all of the ads? My computer says it will be 12 pages and, when I printed the first page, it is too tiny for my eyes to read. So, I need it to be as large of print as it is on the computer and no ads. Is that possible? I want you to know that I love this pattern/tutorial! So I am excited about trying to do it. - Highlight the text and photos you want to print. - In the print dialogue box, look for a setting where you can print just the selection. That setting will vary from printer to printer. By selecting the text from Materials to Finishing off, I could get it down to seven pages. I'd love to see photos of your creation. Thanks for this. Made two from my husbands old jeans as a test for my new vintage singer 99K hand crank. Worked beautifully. Now in use as scrap material holders. How cool that you used my tutorial on a hand crank machine!!! Thanks for letting me know, Sarah. I'd love to see pics of the jeans basket with the hand crank sewing machine. I've sent you an email with the pictures. It was the easiest way I could think of doing it. Been looking for a pattern like this. 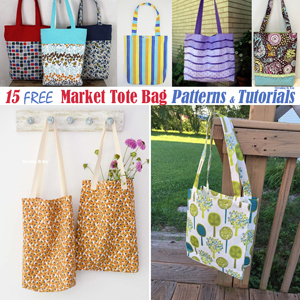 I'm a quilter and want to make the small bag to put scraps in when I'm squaring up my blocks. Nice small footprint on your cutting table. Thanks! 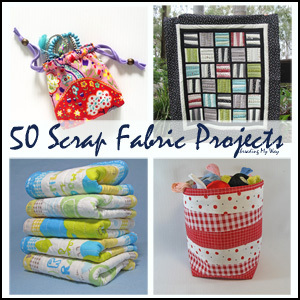 A basket for quilting scraps is a great idea. Love to see pics when you make one. Thanks for taking the time to leave a comment. This is a lovely idea, and little baskets are always useful! I don't think I can ever have too many little baskets. Thanks, Anna. Awesome idea to add buttons on the side seams, Julie. Love to see pics of the ones you make. Muchas gracias, Patricia. He hecho varias canastas de denim ahora. I have taken this great idea and up cycled baby jeans. I cut off the legs and use the top part of the pants. It's a nice sized gift basket or storage. You can use the little pockets for gifts or to stash your treasures. I put coordinating ribbon thru the belt loops...they are too cute for words! What a great idea! I'd love to see photos of your basket. Pam, what a wonderful thing you did...sharing this tutorial with us. I'm about half way done making a little basket using your instructions. However, I didn't use jean fabric (but I will next). I'm making a Halloween basket. The outside is pumpkins and ghosts, and the lining is candy corns. What I did learn for your tutorial was #3 when you said to offset the outer seam and the lining to reduce the bulk in that area. What a WONDERFUL tip. Thank you again and keep the tutorials coming for us. I'm so pleased you are finding the tutorial helpful,KJ. I'd love to see photos of the basket(s). Happy sewing! There are so many uses for containers like this. I just watched a Craftsy class on how to grow a garden in small spaces. Fabric containers for plants use less water than terra cotta and are easier to move around because they weigh less. These baskets could also be used to display plants indoors on tables. shelves or floors. And a potted plant or flowers planted in a cheap or free plastic container could be placed in a fabric basket and make a nice hostess gift or present for a shut in or patient in the hospital. I am retired and on a budget so buying flowers from a florist is too expensive but you could use a plant from the garden and put it in a fabric basket and it would cost you nothing.